Chapter 9 extract: Gairloch is pure seaside golf – yes, it is a links course but it is more than that, it is within sight and sound of a well-used beach. The soundtrack to golf at Gairloch is excitable shrieking children, the gentle lapping of waves and the barking of frisky dogs taking too much salty air. It is the holidays of my childhood when walks near the beach skirted the local links and very serious ladies and gentlemen in chequered trousers could be seen staring intently at bushes and in the long grass as though searching for their lost youth. 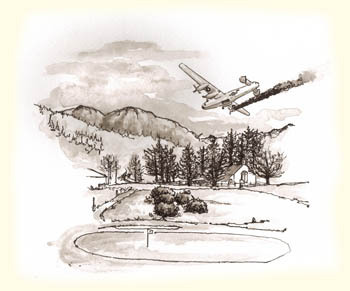 The drawing shows the view of the 8th green from the 9th tee. The aircraft in distress is B-24 Liberator bomber, serial number 42-95095 – the story is covered in the book.